Tire Scythe from Dillon Floyd Weitl on Vimeo. The Tire Scythe is the newest must have accessory for the Tire Demon! This new Scythe will save you hours on tire prep and will allow you to completely prep a race tire in MINUTES! The unique and innovative tool head offers a two second tool change as well! This is totally portable so if you have to buy a new tire at the track it allows you to mount it and prep it in MINUTES! 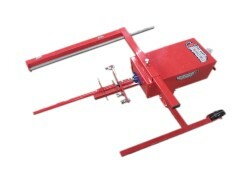 This tool will easily prep over 100 clean tires before replacement blades are necessary. This is a MUST HAVE for any Race Car Team! The Tire Scythe comes With Both Diagonal Heads, Cross Tread, and Two Circumference Heads including 1/8" Circumference Spacers and 3/16" Circumference Spacers. If you want a needler head those are sold separately. The Tire Scythe is Patent Pending.